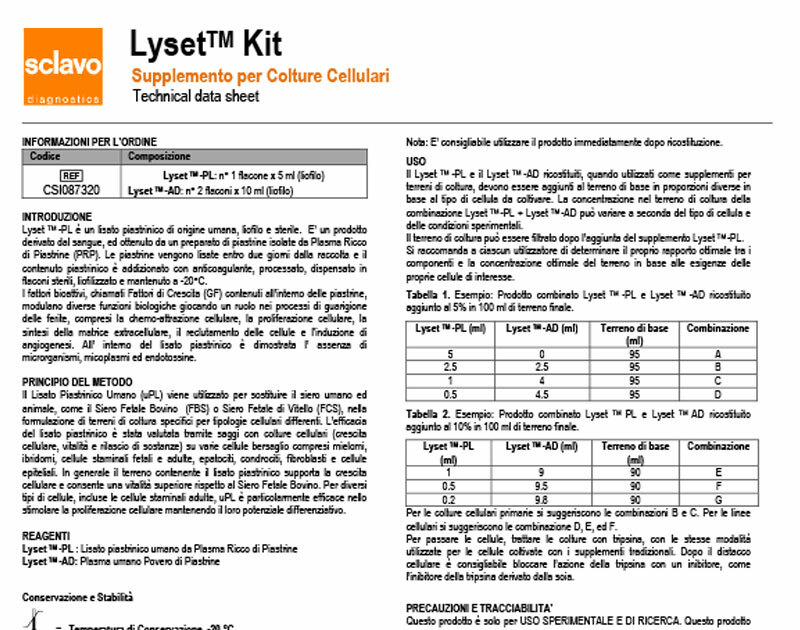 Lyset™ is manufactured by Sclavo Diagnostics International S.r.l. on Biorigen International SA licence. hPL contains readily available growth factors which promote faster soft tissue regeneration and wound healing. hPL has more growth factors than FBS and FCS. hPL does not present the potential risk of prion, zoonose and viral contaminations as FBS and FCS do. The goal is to develop a stable freeze-dried standardized human platelet lysate (Lyset™) which could supersede currently available “home made” PRP and PL disadvantages. 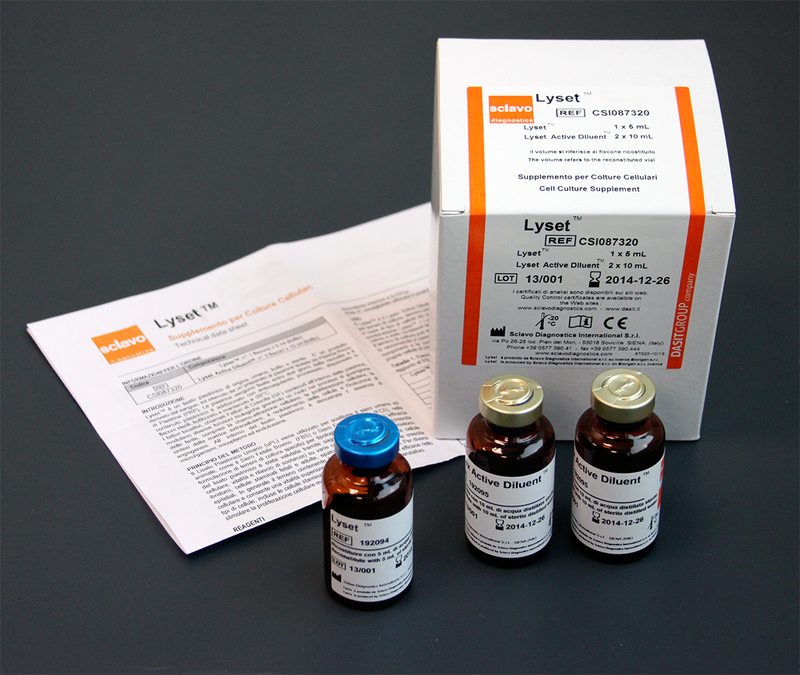 Sterile buffy coats from which Lyset™ is derived, are coming from Certified Blood Transfusion Centers. 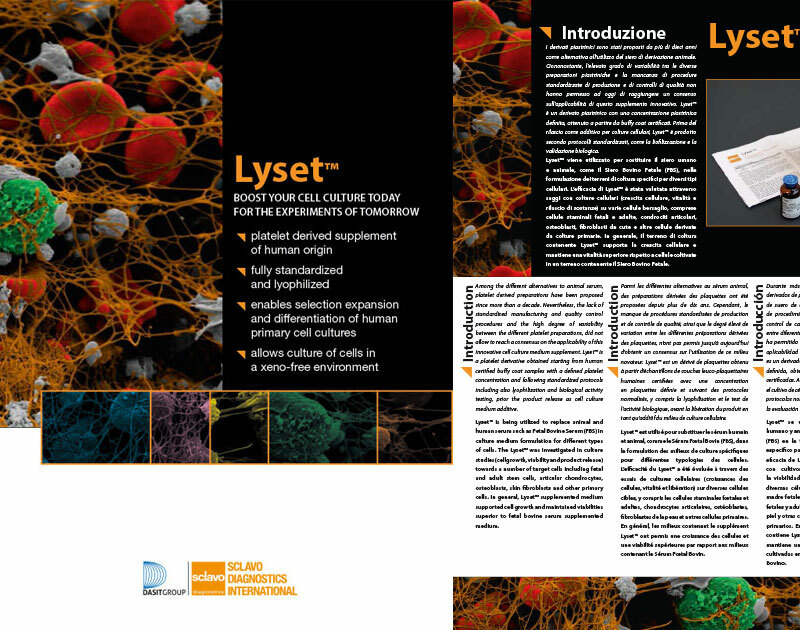 Lyset™ manufacturing process is standardized and guaranties sterility of the final product. 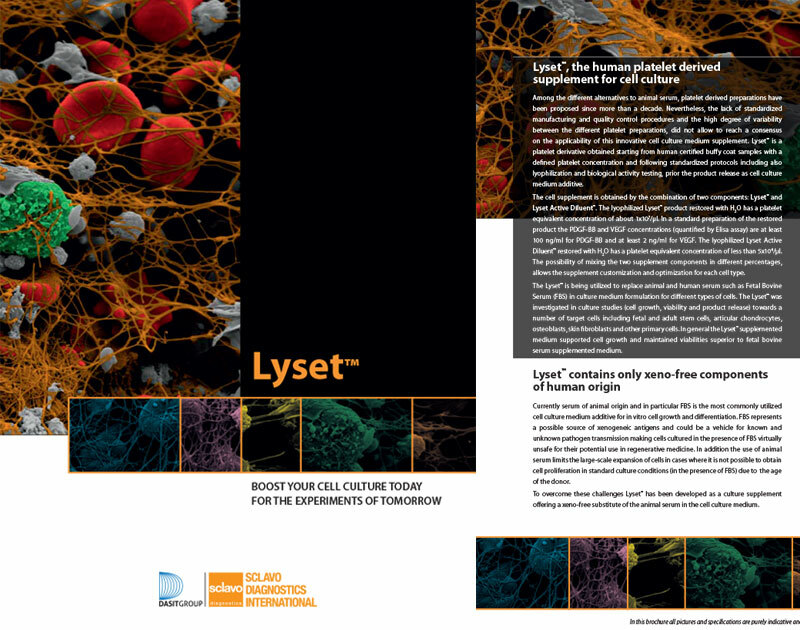 Lyset™ is standardized at 10 x 106 platelets/μL with PPP (Platelet Poor Plasma) by platelet counting. Main Growth Factors are measured via ELISA techniques. Contaminating WBC and membranes carrying blood groups and HLA receptors are discarded. Lot to lot variations are limited due to large batch size. Quality controls on the final products are performed (sterility, biological activity absence of endotoxins,..). 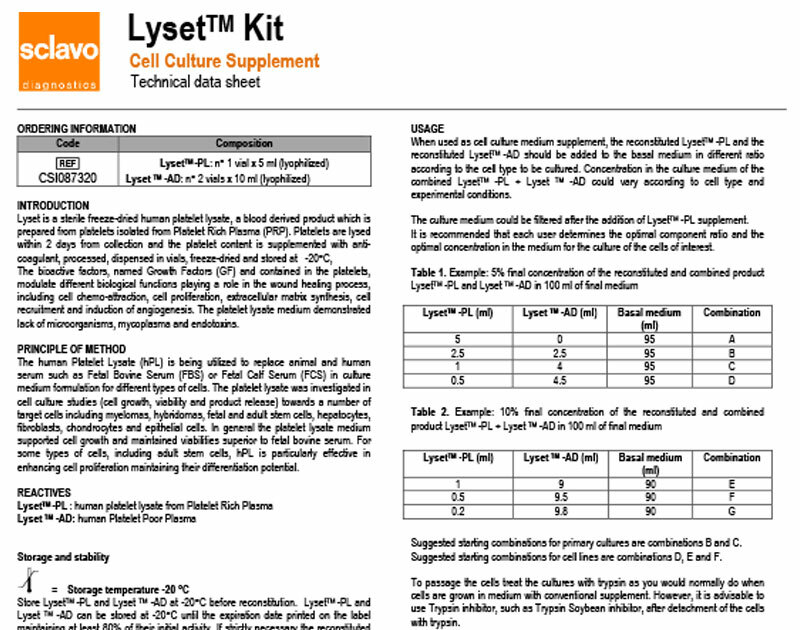 Lyset™ has already demonstrated to be more efficient than FBS in cell culture. Biorigen S.rl. was founded in 2003 in Genoa (Italy) and specializes in Regenerative Medicine (Platelets growth factors and stems cells). In 2012, the company started evolving from a pure R&D operation into a commercial oriented enterprise by opening its share-capital to foreign investors with the creation of its Headquarters, Biorigen International, in Switzerland. Sclavo Diagnostics International S.r.l. is active in research, development, production and marketing of in vitro clinical diagnostic reagents kits as well as in Clinical Chemistry, Specific and Urinary Proteins, Serology, Immunology, Bacteriology and Molecular Biology. Achille Sclavo (1861-1930) was a scientist, entrepreneur, public health expert and a prominent public figure in the fight against infectious diseases. Dr. Sclavo completed his work by founding the Istituto Sieroterapico e Vaccinogeno Toscano “Sclavo” in Siena in 1904. The first diagnostic products was developed in 1934 and after the acquisition of vaccine production by the Chiron Company, was born in 1992 Sclavo Diagnostics International S.r.l. that operates, since 2003, in the new plant of Sovicille (Siena) with technologically advanced equipment. On June 1, 2004 Sclavo becomes part of Dasit Group holding.